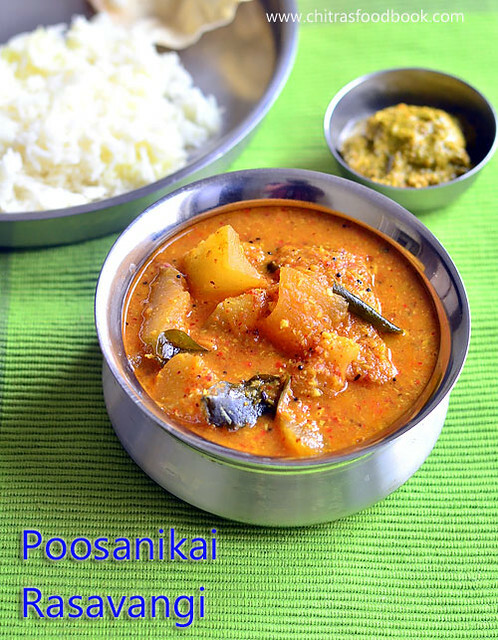 Poosanikai rasavangi / pumpkin kootu for rice is a healthy and tasty side dish for rice. I learnt this vellai poosanikai rasavangi also known as poosanikai kootu from my MIL. Usually we make Kathirikai rasavangi and very rarely vellai poosanikai rasavangi. Whenever we buy white pumpkin, we make juice with it. 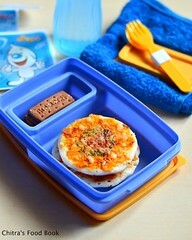 But this time I wanted to try some other interesting recipes with it. 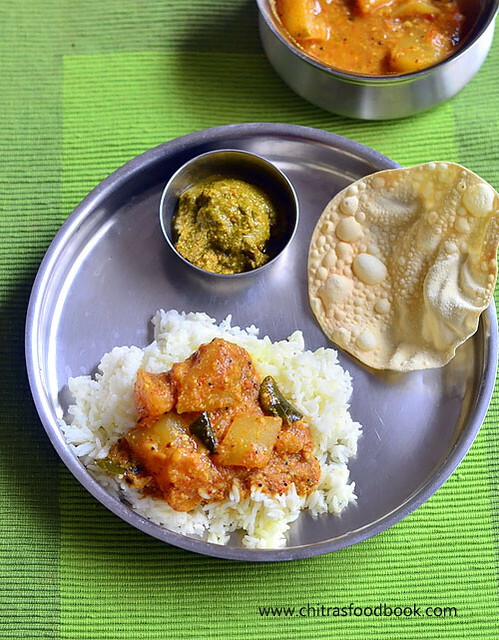 So I asked my MIL for this rasavangi recipe and prepared for our lunch along with coriander leaves thogayal. Tamil brahmins also make rasavangi but slightly in a different way. 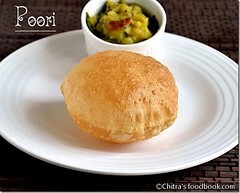 They add toor dal or chana dal along with pumpkin. But we add dals only for making rasavangi powder. 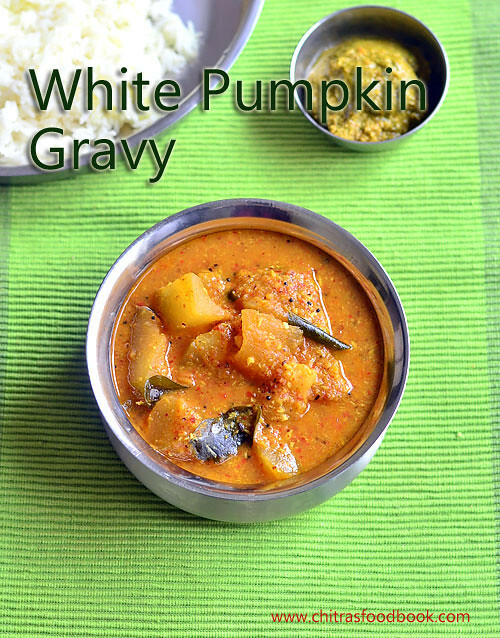 My MIL makes this gravy in an open pan and cook the pumpkin in tamarind extract. But I make it directly in a pressure cooker. Its an easy one pot kuzhambu for me. This method helps me to cook faster during busy mornings. When I make this pumpkin gravy, I don’t make any specific side dish. 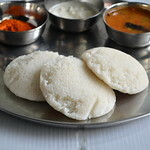 I just make some thogayal or podi to accompany this dish. We mix this gravy with rice adding ghee. Tastes great with simple roasted papad as side dish. We do make a gravy with yellow pumpkin for rice. 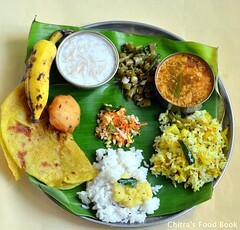 We call it as Parangikai chutney. Its procedure is completely different from this. I have given the link below. Ok, Lets see how to make white pumpkin kootu/ Vellai poosanikai rasavangi with step by step pictures. 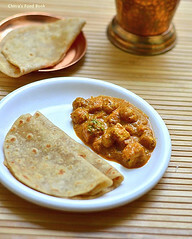 Do try this easy poosanikai rasavangi in a pressure cooker. 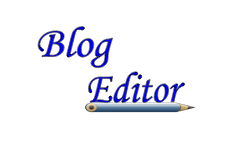 Share your feedback with me. 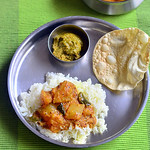 Do check out my Kathirikai rasavangi recipe, Yellow pumpkin gravy , Pumpkin sambar and White pumpkin halwa recipes. Wash and cut the pumpkin into big cubes. Splutter mustard, urad dal, curry leaves.Add pumpkin pieces and saute it. Add turmeric powder, tamarind extract, salt and mix well. 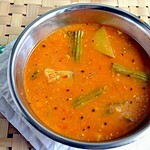 In a kadai,heat oil, roast the ingredients except coconut given under"roast & grind". Add coconut and grind to smooth powder. Add this powder to the cooker.Mix well. Cook in low flame for 2 whistles. Remove and garnish with coriander leaves.Serve with rice. Wash and cut the pumpkin into two halves. Slice them into big pieces and remove the seeds in the middle. Chop into big cubes and slice the skin. Set aside. Soak tamarind in water, take 1 cup extract and keep aside. In a small kadai, heat oil and roast the dhania, urad dal, chana dal, red chillies, hing and roast till golden. 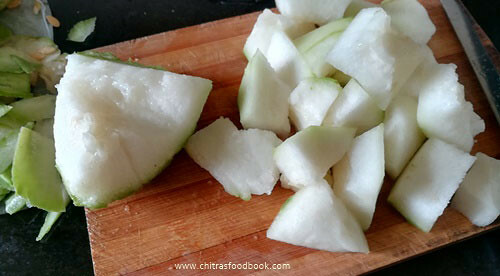 Remove and grind with coconut to a smooth powder. Heat coconut oil in a cooker base. Splutter mustard seeds, urad dal, curry leaves. Add chopped pumpkin pieces, turmeric powder & saute for a minute. Add tamarind extract, salt and 1 cup of water. Add the ground powder.Pressure cook in low flame for 2 whistles. Open the cooker after steam is released. 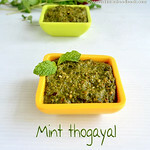 Garnish with coriander leaves and mix well. Serve hot with rice. Do not add more tamarind because pumpkin will absorb all the tangy taste. Usually my MIL cooks the pumpkin separately and add to the gravy. But I make everything in a cooker for ease. 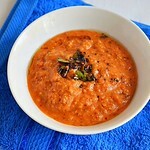 Adding chana dal, urad dal, coconut gives thickness to the gravy. We usually mix this gravy with rice. 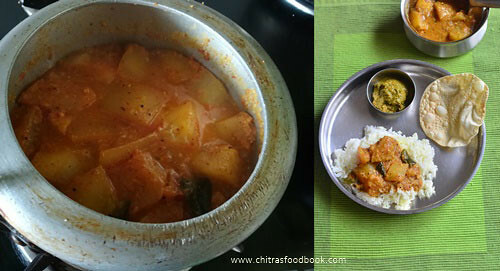 You can make it thick and serve as kootu for vathakuzhambu rice. 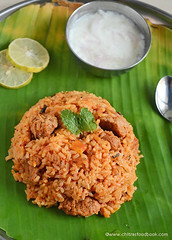 Try this easy, vellai poosanikai rasavangi recipe for rice and enjoy !